In October 2016, the Brazilian President Michel Temer used the motto “Let’s pull Brazil out of the red” with a double meaning: as a piece of marketing for the harshest austerity program in the world and direct attack on the Workers’ Party whose flag is red. The austerity program in question supposes that the federal government’s spending for education, healthcare, pension, and infrastructure until 2037 can be increased yearly based on the inflation rate of the previous year; however, this does not apply to the interests and amortization of public debt that the government has to pay to financial institutions. In this context, the use of that slogan is more than just an ironic reference to one political party. It is a clear, official declaration both that Brazil is being put in service of the global financial system and of opposition to any trace of a leftist political agenda. 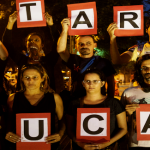 In the last few years, Brazil has experienced the demonization of what are considered “leftist,” “communist,” or simply “red” ideas and attitudes. For example, in December 2015, the Brazilian singer and songwriter Chico Buarque, an icon of the resistance during the dictatorship that ended in 1985 and long-time advocate of progressive politics, was a victim of aggression outside a restaurant in Rio de Janeiro. Some politicians are trying to approve laws prohibiting any kind of discourse inside schools that reveal ideological choices. Those politicians are connected to a movement that incites students to denounce any teacher who seeks to develop critical thinking. Within this movement, any critical analysis of social problems created by capitalism is considered “indoctrination”; yet it is not considered indoctrination when education promotes the uncritical acceptance of the status quo. The real aim is to confine education within the limits of a neoliberal agenda and prevent the development of a critical and reflexive worldview inside the schools. In order to explain the rise of this belligerent obscurantism and the fight against it, it is necessary to develop our theoretical, critical resources. In Brazilian education, hegemonic pedagogies work in tandem with the pragmatic necessities that emerge from everyday life. However, these pedagogies do not make any distinction between the concrete and the pseudo-concrete (Karel Kosik). The challenge, then, is to go beyond the pseudo-concrete and develop the theoretical mediations that facilitate critical engagement within a society that is antithetical to the one-dimensional, capitalistic reality. Newton Duarte is a full Professor in Psychology of Education and Pedagogical Theories at University of Sao Paulo State, Araraquara, Brazil. He is also the coordinator of the research group “Marxist Studies in Education.” Newton specializes in theoretical mediations that connect the critical analyses of contemporary, social reality with debates in the field of pedagogy. He has written on dialectical foundations of a critical theory of education based in thinkers such as Antonio Gramsci, Karel Kosik, Georg Lukács, Lev Vygotsky, Aleksey Leontyev, and others. He is currently working on two projects: the study of art and human development in Lev Vygotsky and Georg Lukács and the study of freedom as one of the key concepts of a critical pedagogy. Co-sponsored by SFU’s Institute for the Humanities, Global Communication M.A. Double Degree Program, and School for International Studies.